Oh boy, do we love our seashell collecting. It’s like our own treasure hunt, walking the beach leisurely as we scan the sand for good finds. Some days, the shelling is so good, we’re at it for hours! Some days, the shells are few and far between but we soak in the sun and sights along the way, nonetheless getting a hefty dose of salt air. Each shell has its own special story: some are amazingly pristine, and others broken and worn but charming in their own uniqueness. So to put some of our favorites on display to enjoy, we decided to make a shell shadowbox! While it’s by no means a new idea, each is as unique as the seashell collection of each person. 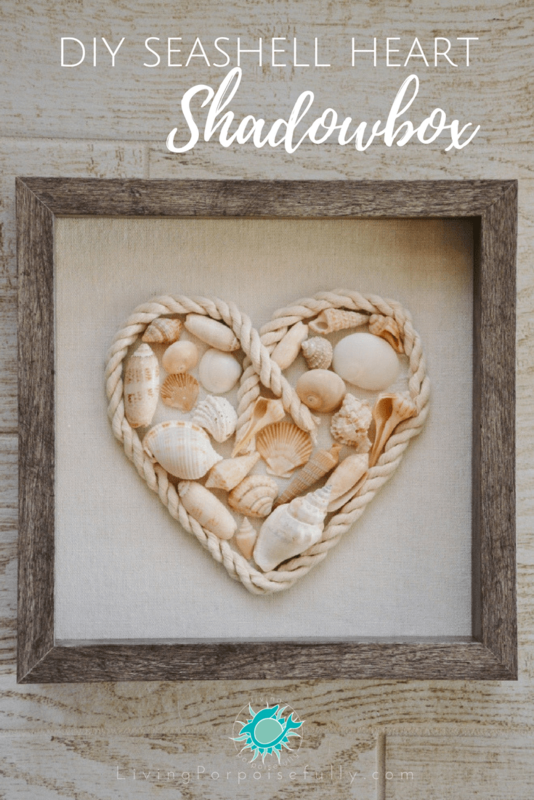 It’s a simple way to display some of your favorite shells using 3 main ingredients: a shadowbox, craft rope, and seashells. Now it’s time for some puzzle fun! Arrange the seashells inside the heart, first without gluing them down. Have fun marveling at the seashells you’ve collected, and the memories they bring! Once you like how the shells are arranged, use the hot glue gun (careful to keep it away from your fingers) to secure each seashell. We thought we might use some ribbon around the border, but really liked the sweet, simple beachy look. However you go about making your seashell heart, relish in the times of sand and sea and the joyful experience that crafting can bring!